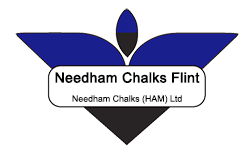 Needham Chalks (HAM) Ltd is the largest supplier of quarried chalk in East Anglia, producing over 100,000 tonnes of chalk from 5 quarries throughout East Anglia. We are also proud to be able to say that we are the UK’s largest producer of whole and knapped flint for decorative building work, with bespoke projects such as Windsor Castle, Southwark Cathedral, Canterbury University Library and many more, under our belt. HAVE A QUESTION OR NEED FURTHER INFORMATION? GET IN TOUCH!